We had a successful pop-up adventure one lunchtime during SXSW 2017 with Soylent, and they returned to us with a radical idea. During an academic year at University of Texas at Austin, approximately 20,000 students live in the West Campus neighborhood. This is a surprisingly underappreciated market. As in, the author – an eight-year veteran of the local pedicab industry – cannot recall any pedicab company ever working, or working an event or campaign, in West Campus. Soylent proposed we change that. For the first five days of the fall semester, starting August 30th, Movemint Bike Cab sent six Soylent-branded pedicabs with likewise branded pedicab drivers to West Campus. Each pedicab carried a cooler capable of carrying 60 14oz drinks. Each pedicab carried additional 12-pack cases in their trunk spaces. Each pedicab, manufactured by Movemint’s subsidiary Precision Pedicab, was equipped with a tailgate. When the pedicabs arrived to West Campus, their instructions were to lower their tailgates, secure their coolers onto them, and then circulate throughout the neighborhood, offering students free drinks and free pedicab rides to school. Each pedicab driver was committed to a 4-hour shift, from 8 AM til noon. It was a huge success. We distributed a minimum of 150 cases, or 1,800 bottles. The author truly cannot estimate the number of pedicab rides, as the number increased day-to-day (students under the age of 21 were likely unfamiliar with pedicabs), but a conservative estimate would be 300. 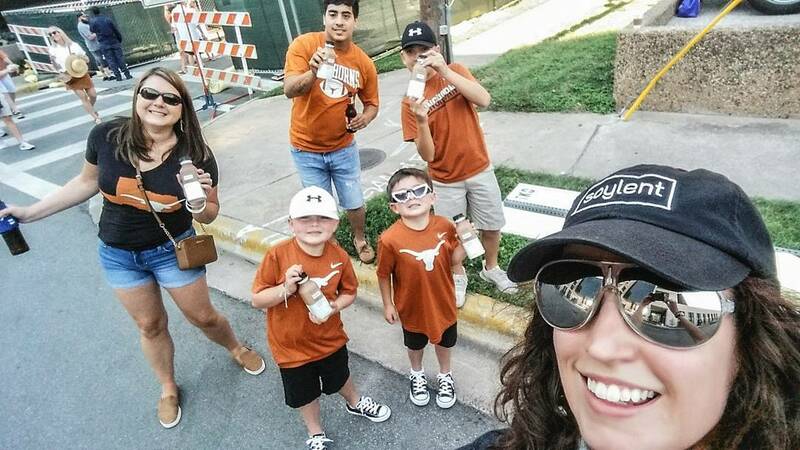 Another similar aspect of the Soylent campaign was that, for the first two University of Texas Longhorns college football games, Movemint Bike Cab would provide fans free drinks and rides to and from the stadium. Again, it was six branded pedicabs, with likewise branded drivers, operating tailgate pedicabs, working 4-hour shifts. A UT football game is attended by some 100,000 fans. 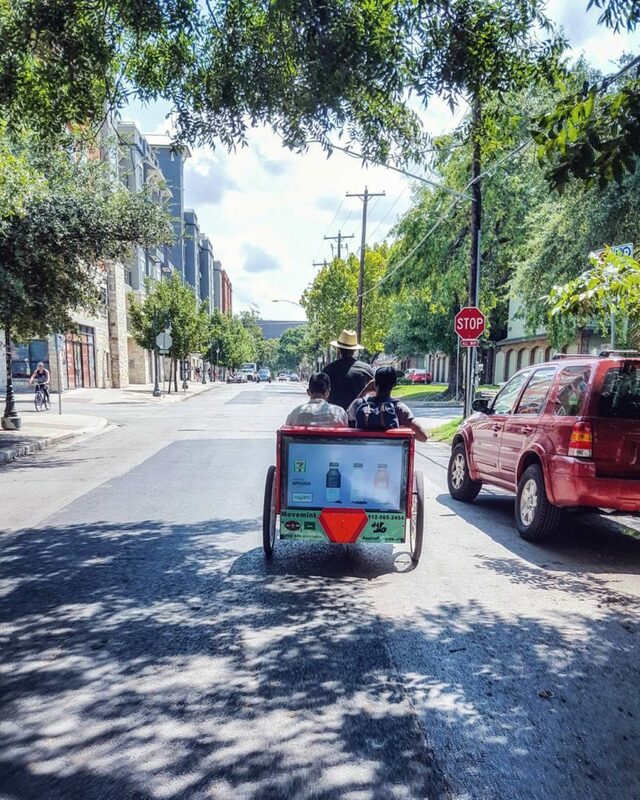 Movemint’s co-owner, David Knipp, complemented our West Campus presence with a TV pedicab. 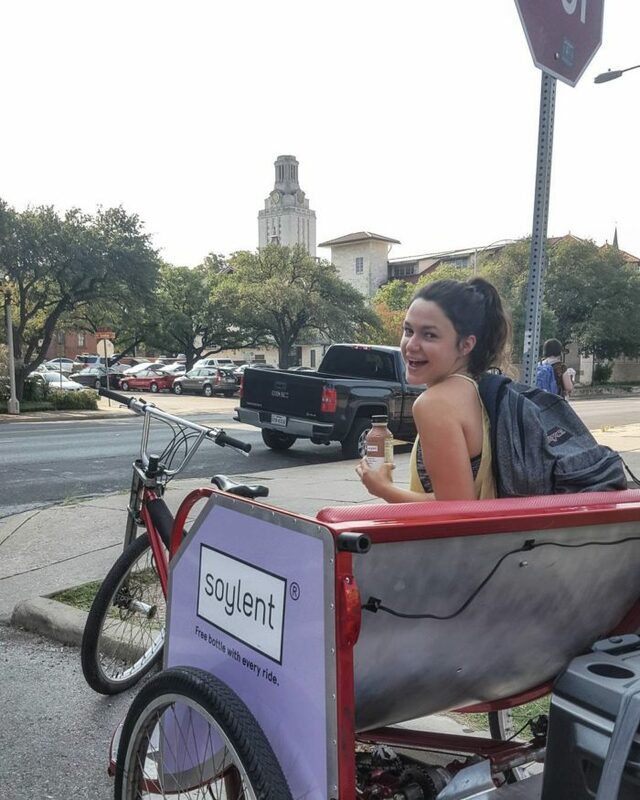 Soylent also included six TV pedicabs in their advertising campaign. Movemint debuted the pioneering TV pedicab during Summer 2016. The TV pedicabs are deployed ever weekend, and basically any shift their designated pedicab driver otherwise works. It’s been estimated that 20,000 people visit in downtown Austin every weekend. It’s a multifaceted campaign, and quite possible the most in-depth Movemint has ever worked. It’s been fun. It ends September 30th.